The way torpedo attacks were performed depended on whether the attacking vessel was a submarine or a surface vessel. Surface vessels – torpedo boats, destroyers, cruisers – usually attacked jointly while the submarines attacked individually – even when operating in groups, attacks of individual submarines were not coordinated. Joint attacks of surface vessels could be easily spotted and proper countermeasures could be taken – i.e. an evading maneuver. In such cases, enemy evading action was compensated for by a large number of torpedoes launched by many vessels. The submarines performed torpedo attacks when submerged or – in poor visibility conditions – on the surface. Generally, the attacking submarine was not spotted so there were no evading maneuvers. In such conditions, attacks performed by single submarines launching a small number of torpedoes were effective. The procedure employed for aiming and launching straight-running torpedoes depends on whether the torpedo tubes are fixed or trainable. Fixed torpedo tubes were installed on the decks of torpedo boats and in submarines. Trainable torpedo tubes were installed on the decks of destroyers, cruisers and battleships. Torpedoes launched from trainable torpedo tubes could be fired independently of own ship’s course. In the case of fixed tubes, it was necessary to aim by changing the course of own ship. This caused some tactical constraints which were partly removed after the introduction of torpedoes equipped with gyro-angling gear which allowed changing the course of the torpedo after it left the tube. In the case of submarines, the main constraints were a low submerged speed and limited range underwater which made the lengthy pursuit of a target impossible. Due to these constraints it was very difficult for a submarine to achieve a good torpedo firing position. During WWI German U-Boats developed numerous variants of torpedo attacks which were intended to neutralize these constraints. The methods presented below were describe in an ONI publication issued in October 1918 and declassified in August 1972. Generally, a U-Boat could only perform an attack if the angle on the bow of the target was less than 30º - that means that the attacking submarine was on the target’s course. The other case was when the target was spotted at such a distance that the U-Boat was able to cruise full-ahead for a long time on the surface to gain an attack position without being spotted. When a U-Boat approaches a target so close that there is a possibility of being spotted, she submerges and continues approaching at periscope depth. Meanwhile - by means of periscope observations - the target’s course parameters are determined and the plot is created. When the distance gets closer to 4000 meters, the commander uses the periscope more carefully each time decreasing the U-Boat’s speed down to 2 knots. a) a) Angle on the bow at the moment of spotting the target is in the range of 25º to 30º. The U-Boat starts cruising with great speed on a course perpendicular to the target bearing. After closing to the point from which the attack position can be achieved using low speed, the U-Boat turns to a course perpendicular to the target course and decreases speed. On the torpedo director the target speed (from the plot), the track angle equal to 90º and torpedo speed are set. The deflection angle β is read from the director and set on the periscope. Then the commander adjusts the U-Boat speed so that the length of the torpedo run at the moment of the target appearing in the periscope crosshairs was about 400~500 m.
b) Angle on the bow at the moment of spotting the target is in the range of 5º to 10º. The U-Boat cruises submerged with the lowest possible speed at periscope depth on the same course as the target. Meanwhile, as the target is approached, subsequent observations are used to determine the actual course parameters. When the angle on the bow increases to 15º~18º, the U-Boat turns to make her course perpendicular to the target course, and then, cruising at slow speed, launches torpedoes when they are close enough. c) Angle on the bow at the moment of spotting the target is 0º. The U-Boat is cruising away from the target on a course perpendicular to the target’s course, and when it reaches a distance of 800 meters, it turns to a course parallel to the target’s course. Then she cruises at the lowest possible speed while waiting to be overtaken by the target. Then the U-Boat makes another turn and begins the torpedo attack. d) Angle on the bow at the moment of spotting the target is greater than 15º. The U-Boat cruises on a course perpendicular to the target bearing. When the target bearing moves astern, the U-Boat turns about 10º toward the target to keep the bearing constant. When the distance decreases to 2000 meters, the run-in for a standard torpedo attack is performed. e) Angle on the bow at the moment of spotting the target is equal to or less than 15º. The U-Boat starts cruising at high speed adjusting course in such a way that the target bearing is 45º. When the angle on the bow reaches 8º to 12º, the U-Boat turns to make her course perpendicular to the target’s course. When the distance decreases to 2000 meters, the run-in for a standard torpedo attack is performed. 2. Launching torpedoes from stern torpedo tubes. Attacking a target with the stern torpedo tubes is the simplest form of attack. All methods of such an attack require the U-Boat to take up an attack position in front of the target. a) After taking the position up, the U-Boat cruises slowly on a course opposite the target’s course. When the U-Boat gets closer to the target, it turns 90º and launches torpedoes when the target appears in the crosshairs of the periscope, which was set to the deflection angle determined by the torpedo director. b) After taking the position up, the U-Boat cruises on the same course as the target to accurately determine its course parameters. Then she closes the target and turns in such a way that her course is 135º relative to the target’s course. When the U-Boat gets closer, she slowly turns to a course opposite the target’s course, then finally she makes a hard turn on the other side to position her stern towards the target. Then a standard torpedo attack is performed. c) (The fastest attack) - beginning with the U-Boat positioned directly in front of the target, she goes away on a course perpendicular to the target’s course. When the distance between the U-Boat’s course and the target’s course is 100 meters, she makes a turn to a course opposite the target’s course. When the distance between the U-Boat and target decreases to about 2000 meters, the U-Boats decreases speed and makes a turn to position its stern towards the target and performs a standard torpedo attack. A characteristic feature of a standard torpedo attack was that they launched torpedoes very close to their target (about 300 – 500 meters) as a result of the limited running distance of early German torpedoes. Additionally the relatively small amount of explosives in the warhead made an explosion at that distance safe for the attacking U-Boat unless of course the target’s cargo (ammunition, gasoline, etc.) exploded. The earliest German torpedoes type C35/91, despite entering service at the end of the 19th century, were successfully used by German U-Boats during the years 1915-1916. However their short running range forced them to attack from a short distance. It should be noted that during a submerged attack at periscope depth, such director was used only as a calculating device - it was not used directly for aiming. After setting the correct track angle and target speed (and optionally torpedo speed) the deflection angle was read. Then the periscope was set to this angle (relative to the midship line). When the U-Boat took up a proper position relative to the target and was on the course which was appropriate for the assumed track angle, all that was left to do was to wait until the target entered into the crosshairs of the periscope. Then the torpedoes were launched. Calculating discs were used to calculate the approach course, target course and so on. Mentioned earlier the Lagenwinkelscheibe made possible determining one of these three values - target course, real target bearing and angle on the bow - knowing two others. Its usage was mainly restricted to calculations during the creation of the plot because one of the calculated values was the real target bearing which was used only when working with a plot. However, in the case of periscope observations, the directly read value was the relative target bearing which had to be converted to the real target bearing incorporating the own course. For this purpose, there was a more complicated calculating disc, the Angriffsscheibe (equivalent of American Is-Was, Attack course finder). 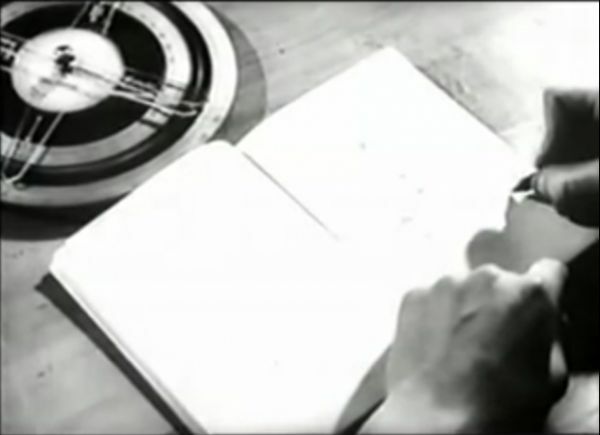 It consisted of three trainable, concentric dials - external (A) indicating relative bearing to the target (Germ. Schiffspeilung), middle (B) – compass rose – indicating own ship course (Germ. Kompaßrose) and internal (C) indicating angle on the bow together with the pointer which indicated target course (Germ. Lagenwinkelscheibe mit Gegnerkursarm). The external dial was provided with a scale from 0 to 360°. 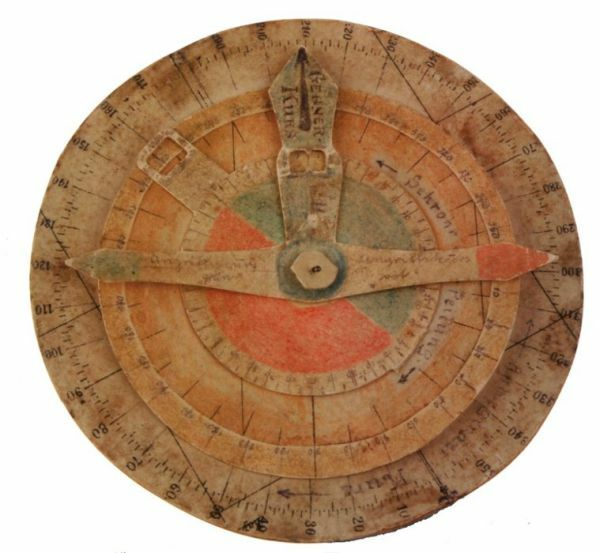 The compass rose was provided with two scales – on the external edge scaled from 0 to 360° and on the internal edge – also from 0 to 360°, but in the opposite direction and shifted by 180° relative to the external scale. 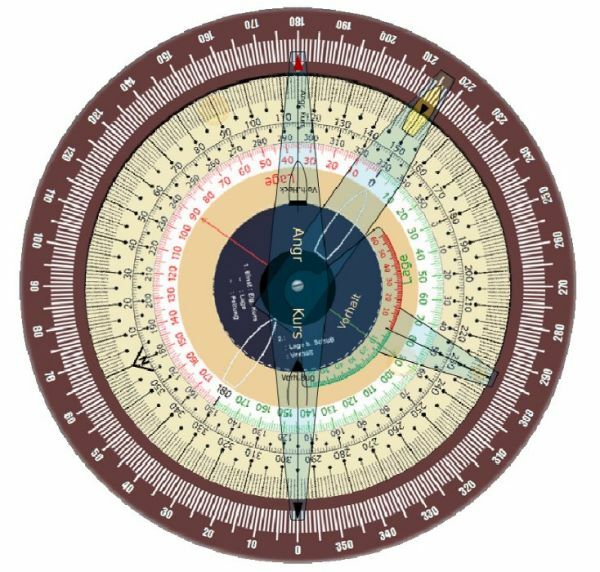 The internal dial was scaled from 0 up to 180° and then down to 0. On the null mark it had a target course indicator pointed outward. As can be seen by comparing it to the Lagenwinkelscheibe – the external dial (A) was added. 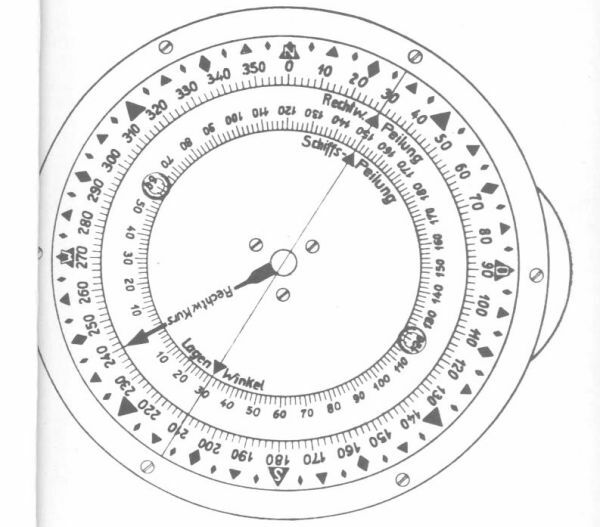 Together with the compass rose (B) it made it possible to convert all relative bearings to the real bearings. Knowing the own ship course and two of the three following values: target course, angle on the bow, or relative bearing – the unknown value could be calculated. Two additional, trainable, transparent pointers: bearing and lead angle (D) (Germ. Vorhaltwinkelscheibe mit Peilarm) and attack course pointer (E) (Germ. 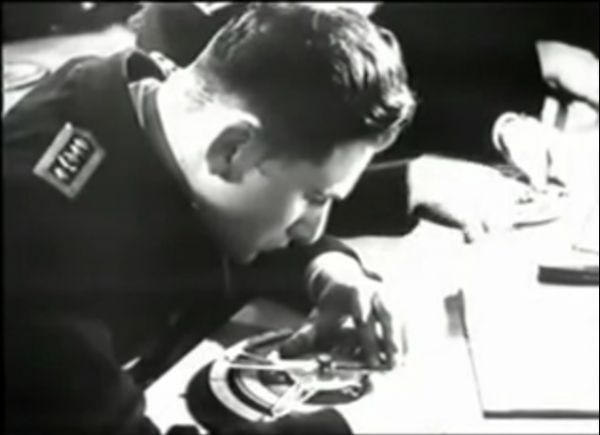 Angriffskurs-Zeiger) enabled calculating deflection angle and determining the attack course for an attack from the bow and stern torpedo tubes. 1. Knowing the real target bearing (22.5°) and target course (135°) to find the target angle on the bow: dial C is rotated so that the pointer indicates the target course on dial B (external scale). Pointer D is set so that it points to the real target bearing on the internal scale of dial B. The angle on the bow is indicated by pointer D on the scale of dial C – 67.5° starboard. Now knowing target speed (10 knots), torpedo speed (20 knots) and angle on the bow, using the torpedo director the deflection angle can be calculated as 27.5° (starboard). Then, rotating pointer E is set in such a way that the end designated Vorh. Bug indicates the value 27.5° (green, because angle on bow is starboard) on dial D. The attack course can be read on the external scale of dial B under the pointer E which is designated Angr. Kurs and is equal to 50°. After turning the U-Boat to this course, straight running torpedoes can be launched from the bow torpedo tubes with a deflection angle of 27.5°. In reality turning the U-Boat would take some time, during which the angle on the bow would change and the whole calculation had to be repeated. However, the new attack course calculated in the next iteration would be relatively small, so correction of own course would not take much time and angle on the bow would not change significantly – so the attack could be performed using the newly calculated deflection angle. 2. 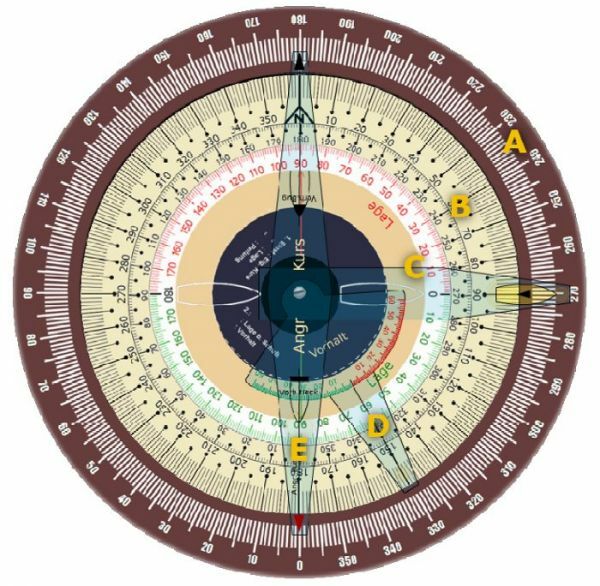 Knowing the target bearing (55°) and the angle on the bow (30° port) to find target course (own course: 195°): the dial B is rotated so that own course is indicated by the triangular mark in the upper part of dial A (over the value 180°), pointer D is rotated so that it indicates target bearing on dial A, and dial C is rotated so that angle on the bow is indicated by pointer D. Target course can be read under pointer C on the external scale of dial B and is 100°. 3. Knowing the relative target bearing (295°) and the target course (150°) to find the angle on the bow (own course: 115°): dial B is rotated so that own course is pointed to by the triangular mark in the upper part of dial A (over the value 180°), pointer D is rotated so that it indicates target bearing on dial A, dial C is rotated so that the pointer indicates the target course on the external scale of dial B. Angle on the bow can be read under the pointer D on dial C and is 80° starboard. 4. 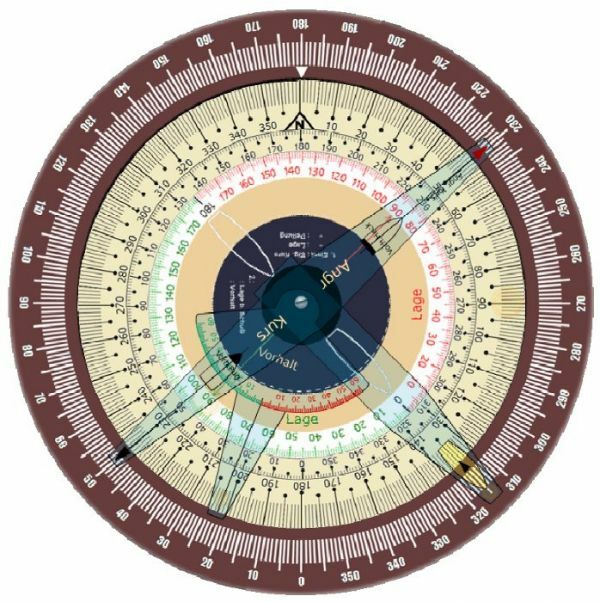 Knowing the relative target bearing (135°) and angle on the bow (30° starboard) to find the attack course perpendicular to the target course (own course: 195°): the dial B is rotated so that own course is indicated by the triangular mark in the upper part of dial A (over the value 180°), pointer D is rotated so that it indicates the target bearing on dial A, dial C is rotated so that pointer D indicates the angle on the bow. 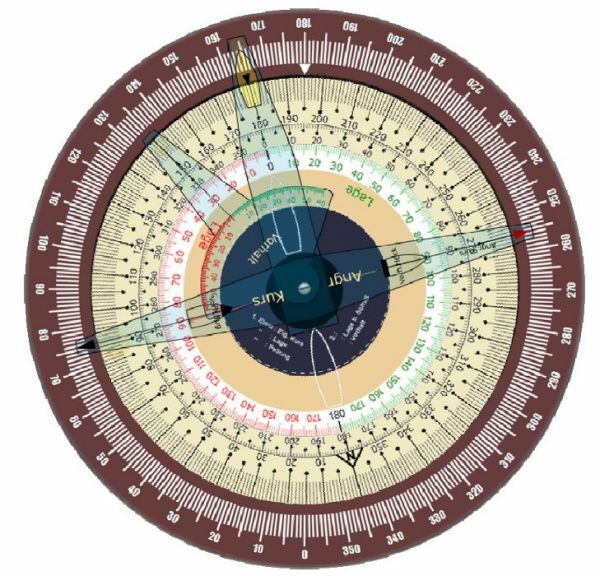 Target course can be read on dial B under the pointer D (180°). 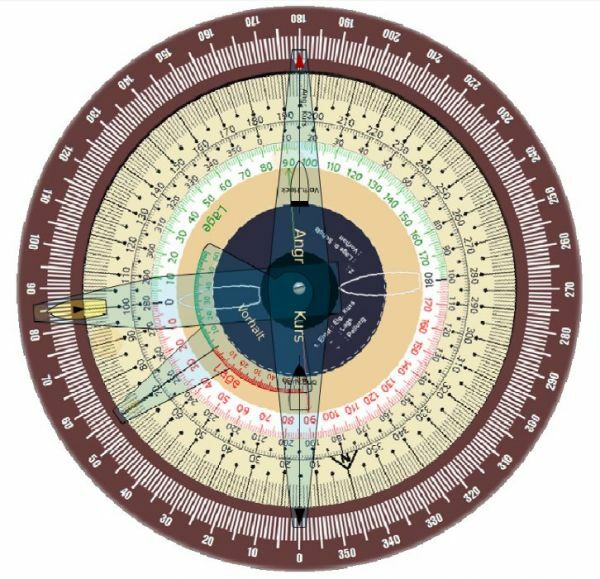 The attack course is indicated on the internal scale of dial B by a red line (because own ship is on the port side of the target) located on dial C which is always perpendicular to pointer C. Attack course pointer E can also be used. Because we want to use the bow torpedo tubes, the attack course pointer is set with its end designated Vorh. Bug on the red line and the attack course can be read on the internal scale of dial B under the pointer designated Angr. Kurs. In the case of an attack with the stern torpedo tubes, the attack course pointer should be set on the red line with the end designated Vorh. Heck. Demonstration showing the operation of such calculating disc is available here.